Is Your Target Dated Fund at Work Safe? Most of us work hard and play hard as much as we can. We try to do the right thing when it comes to investing in our future. We’ve socked away money each paycheck into those 401(k) plans in order to get ahead. The closer we get to retirement the more we’ve heard to allocate our life savings into a target dated fund. Why? Well, they say it’s because you don’t want to lose a big chunk right before stepping into retirement. A balanced portfolio that adjusts away from risky stocks and towards those safe bonds the closer we get, right? Perhaps the biggest risk facing investors this year and beyond is whether bond yields will suffer a sustained rise. We are increasingly worried that the bond market is undergoing a secular pivot from bullish to bearish, and that investors are facing an asymmetric risk profile with limited upside and plenty of downsides. We believe we are facing a secular pivot in bonds. After 35 years of one of the greatest bull markets that sent rates from the mid-teens to near zero, it’s now the endgame. We’re pretty sure more than a few investors are unaware of the risk this poses. Although it is true a bond holder will receive their principal at maturity, all the while being paid that nice interest rate twice per year, many investors owning bond funds inside a retirement plan are not guaranteed the principal at maturity. Why? Because they don’t personally own the bond direct from the creditor. 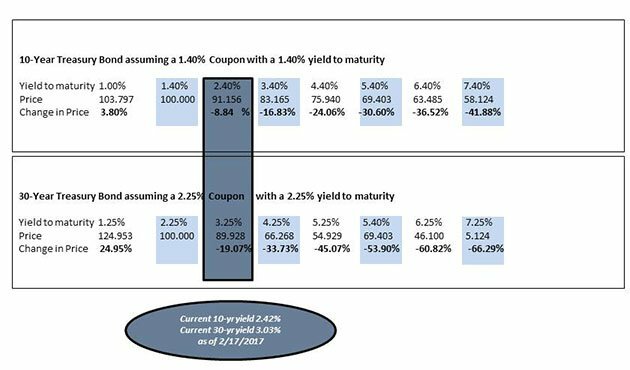 Even if you’ve been wise enough to own bonds directly, INFLATION eats into returns and who wants to buy a 2.4% yielding piece of paper from you when they can get 4%, 5%, or 6%? And speaking of 6%, it just might be here in a few short years. The bottom line for bond investors is this: When interest rates rise, bonds lose value. The chart below shows how much money is lost for every 1% increase in rates. The top section is the 10-year Treasury. The bottom is the 30-year Treasury. As a quick aside, I know I’ve shared this bond scenario with you before but we believe it’s worth revisiting. We don’t believe the average investor knows just how much risk they are taking on with their so-called “safe” investments. Don’t follow the herd of investors who are looking out for the next Tech bubble in stocks or the housing crash that brought down the S&P500. The bond market is much larger than the stock market and it is not immune to significant risk. 1.37% was the low yield back on July 13, 2016. The 10-year Treasury is currently yielding 2.42% and the 30-year is yielding 3.03%. That adds up to a -8.84% loss in value for the 10-year and call it a -16% for the 30-year. Perhaps you don’t realize this because it appears the account is growing, but chances are it’s because the mix of stocks in it have buffered the blow so far but what happens as we continue on this path. The target dated fund must adhere to a specific range of asset allocation which means it constantly adjusts by re-balancing to push out stocks and gain exposure to more bonds. Less exposure to stocks is not going to buffer and increasing exposure to bonds that are rapidly falling in price. Full disclosure, my family does not currently own any bond or bond product. I’m deeply concerned about what these losses will look like when yields rise to 3.4%, 4.4% and 5.4% (similar to where they were in 2007). -30% is a real risk and I suggest taking a look if you’re approaching retirement in the next two to five years. Inflation pressures are gaining momentum both here and in Europe. The Fed’s 2% inflation target was achieved in January. Janet Yellen’s (chair of the US Federal Reserve) unemployment target has long been met. She said earlier last month the Fed’s main tool for setting monetary policy will remain the Fed Funds rate. They will not shrink their $4.45 trillion balance sheet of assets (compared to $2.24 trillion at the end of the financial crisis). As the great Stan Druckenmiller commented a few years ago…Fed policy is, “fraught with unappreciated risk.” He is actually quite optimistic about the U.S. economy following the presidential election and so are we. Our current view is that the Fed monetizes the debt and it evaporates away, however current law doesn’t allow for this so we need to assume otherwise. In closing, the risk individuals may be taking on within their retirement plans is not afforded monetization and may take decades to recover from a few hundred basis point move in interest rates as trends normalize. Many of us never owned bonds 35 years ago and it is my hunch that too many people are complacent to bond risk because it’s been so long since we’ve felt it first-hand if at all. Please call us if you would like to know more about your current plan.